The apathy of Chennai voters let me sad and having celebrated the spirit of the city in December it was a very quick turnaround. The Election Commission may have had its own reasons but giving a long weekend expecting our people to stay at home during the vacation season was optimism at its best. 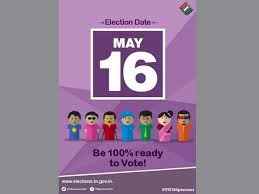 Credit to the EC however for the aggressive campaign to get more voters out but I always felt that the date would be a big mistake and the numbers agreed. Going back to the question “Now what?”: An open letter to the new CM got shared where many came out with their wish list for the government. I agree with the open letter and many more in the same kind. I would just like to add that the present election if not an affirmation of the good that was done earlier but it is the result of the absence of a better alternative since it is only 40%. 1. Stop opening or permitting more professional colleges & closing down the poorly performing ones and open more trade / skill schools instead. Teach jobless people to fish for free instead of giving those fish so that they can eat for a lifetime. 2. Target the freebies with Aadhar and ensure that it reaches the needy instead of being a dole for all. 7. Continue with the efforts started to recover the properties that were grabbed by politically connected people earlier.